We had a group of about 35 that met us there, and we also had scheduled a Lego: Simple Machines class for while we were there. Our teacher was an adult who never wanted to grow up...and now he gets to play with Legos all day long. He was perfect for the group! The kids enjoyed talking about what a simple machine is, what it does, and where they might be found. Then they were set free with a set of Legos and a set of plans to build their own machines. They started with a lever, moved onto a wedge, and finished with a gear assembly. Then they were allowed to make up their own creations or pick from more elaborate plans. The kids LOVED their time in the Lego room. We had a picnic lunch outside (thankfully the weather was PERFECT!). There were so many of us, and so many public school groups there too, that we ended up splitting up a little during lunch. The kids enjoyed the outside area of a stream, pond, frogs and huge musical instruments while they ran around during our lunch break. 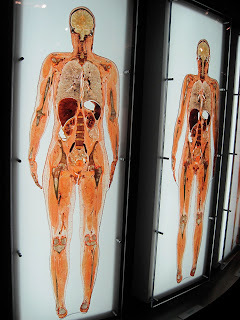 My favorite exhibit inside the museum was the human body hall. They have slices of human bodies, head to foot...one of the most incredible things I've ever seen. All of the kids really enjoyed the engineering hall, where they could program robots, play computers that controlled musical instruments, build roads and create a light show. It was hard to leave that area! Other fun highlights were the dinosaur area and the bonus bird level. The kids loved being able to 'build their own bird' as they worked their way through the kiosks. In the weather area, the boys enjoyed being weather forecasters, reading off of a tele-prompter and seeing themselves on screen. The sports hall might have been our favorite, even though our time there was cut short as we had to step outside to give a friend with a dead battery a jump-start. They have a motion room where they film you while you attempt a sports move, then they send your video to a computer where you can watch it in slow motion. You can also play a video side-by-side of a professional athlete doing the same move, to compare. So fun! The kids enjoyed the race track, where you can be timed while you race against your friend as well as a cheetah, a dinosaur, or a professional athlete on screen. Seriously fun to watch! We had some friends riding along with us (Sarah, Haven and Kate). On the way home, the six children in our car were getting a little restless and wild, so we stopped at a nice rest area to run around. That helped, and we were able to end the day on a really fun note! Field trips are so fun, and exploring the world with friends is the best! November 12, 2012 was a memorable day in our family. Dad was working in the yard, cutting down trees. The boys were running around helping him. Bridget and I were hanging out in the kitchen working on dinner. At one point, Bridget pointed out how hard Henry was working and said, "I'm going to give him a dollar for working so hard!" She grabbed a dollar bill and ran outside. I think this was around 6:30 p.m. 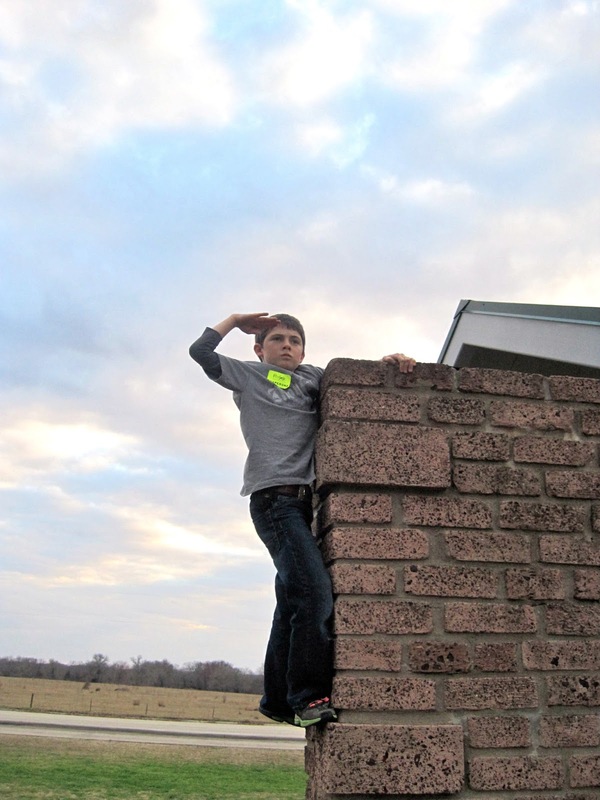 The next thing I know, Jonah is standing in doorway saying, "Mom? I think Bridget needs you. Right away. She fell and she said she wants you." I went outside and found Bridget half sitting/half lying on the ground outside the gate to the goat pasture. On the way to her, I asked if she could get up and she said no. So I went to her and asked what hurt. She was whimpering a little but not really crying, and she pointed to her left arm. I scooped her up into a hug and then helped her stand up. She was able to stand, but I could immediately see that there was something not-quite-right about the way her arm hung down. It made my stomach hurt and I didn't want to believe what I saw. I picked her up very gently and told the boys to get Dad immediately. We walked over to the back yard where Dad met us and said, "What's up?" 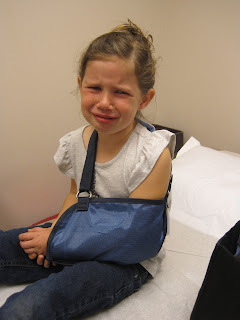 I said, "Well, Bridget fell down and hurt her arm. What do you think?" I let him have a look and he very calmly said, "Ok! Let's all load up in the van. Looks like we're headed to see the doctor!" 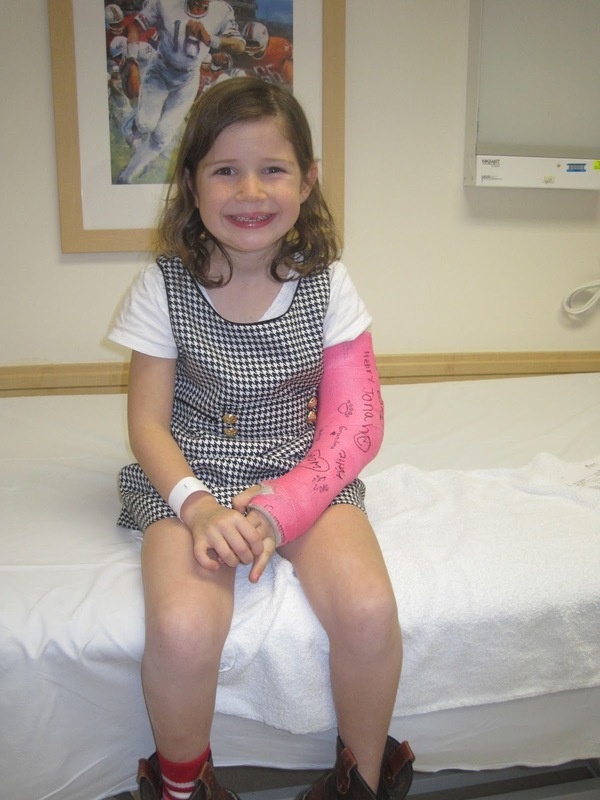 We went back to the room to see the doctor, where he explained that she required surgery and that neither our small town, nor the larger city nearby have a pediatric orthopedic surgeon. Major bummer. He wanted to send us straight to Children's Hospital in Dallas...and tried to convince us to take her by ambulance. Bridget had been doing okay up to this point, but at the mention of going to Dallas, and by ambulance, no less...she melted down. We got her calmed back down and explained to the doctor that we felt it would be better to drive her to Dallas ourselves. He suggested we get going right away and said he would call us in there so we could avoid the ER waiting area. When we got to Children's, it was a lot of 'hurry up and wait'. We checked in and were moved from waiting room to room to ER to I don't even know where. We ended up in a lot of different areas. 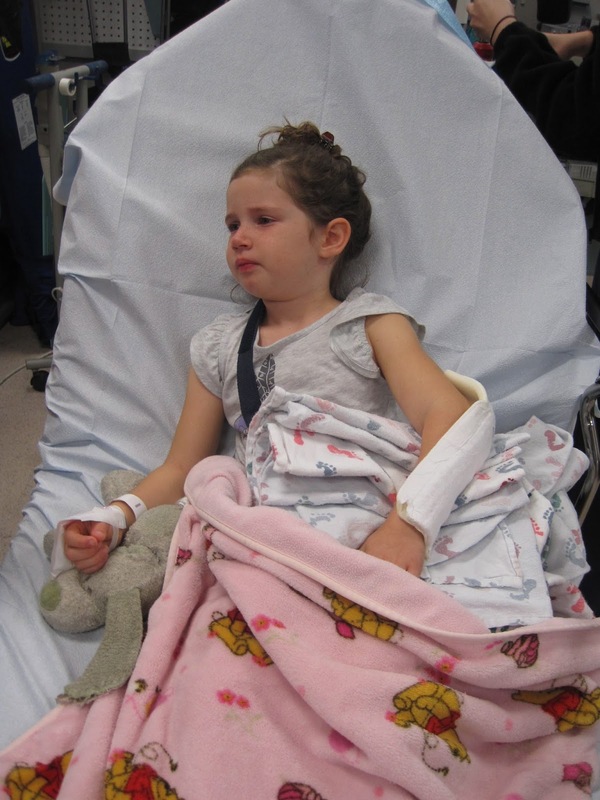 They wanted new x-rays, we had to meet with the on-call pediatric surgeon, they set her up with an IV lock so she would be ready for IV during surgery. 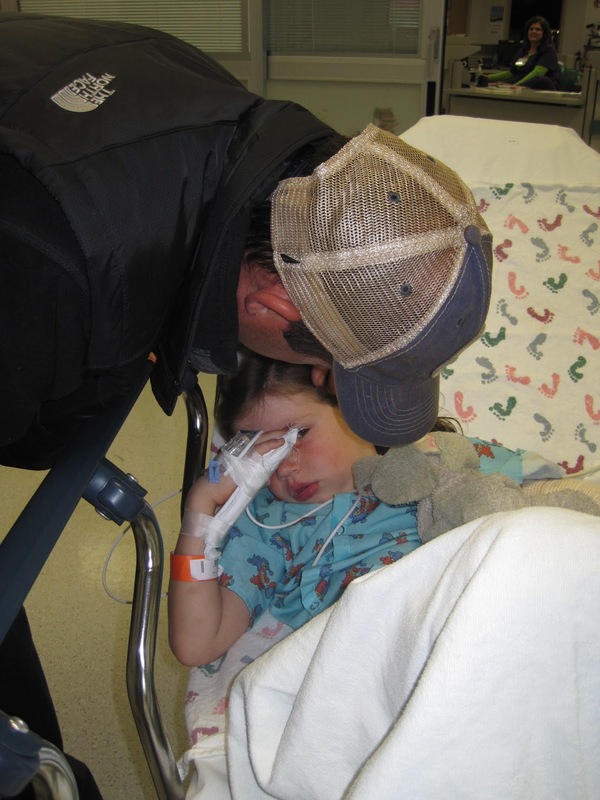 After hours of waiting, they finally decided it wouldn't be worth the trouble to call in an entire surgical team in the middle of the night, so they admitted Bridget to a room and said she was scheduled for the first surgery slot in the morning. If we had known that, I think we would have just spent the night at home and driven in in the morning! They checked on Bridget periodically during the night, so she got very little sleep...and Sam and I got even less! It was a rough night. In the morning, it was even more 'hurry up and wait' for us. Bridget was wheeled through the hospital in a rolling bed and a huge wheelchair...which she thought was pretty cool. Bridget had a pretty good attitude throughout the morning. Sam and I struggled a little as we weren't getting much communication. When she was finally put into the pre-surgery area, we waited a looooong time. The benefit of that long wait, however, was that the hospital clowns came to visit Bridget. They gave her her very own bright red clown nose, some stickers and trading cards. 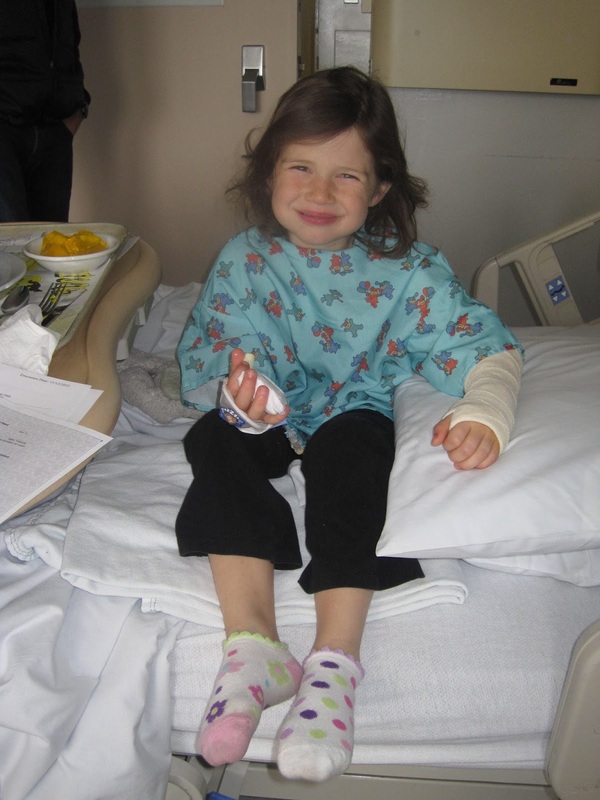 They were a really fun distraction, and after they left it was time to send Bridget off to surgery. It seemed like forever (but was probably only two hours) until they called us to say Bridget was in the recovery room and we could go see her. She was waking up and still a little groggy. Bridget's nurse offered her a rainbow striped popsicle, which she enjoyed for a little while before handing it over to me and saying she was done with it. Rufus had gone to surgery with her and was still lying right beside her. Also during surgery, a stuffed cat, a stuffed butterfly, and a Christmas quilt all appeared on Bridget's bed! They were all items that are donated to the hospital to help make children's time there a more pleasant experience. The surgeon met with us to explain that he had re-set her bone in place and secured it with three pins that would have to be removed in about 4 weeks. We were moved back to Bridget's overnight room and told to order breakfast. They would release her as soon as they saw her eat something substantial. She was not hungry, but ordered an apple, jello and some juice. Once she had a few bites in, the nurse finally ok'd her to head on home. 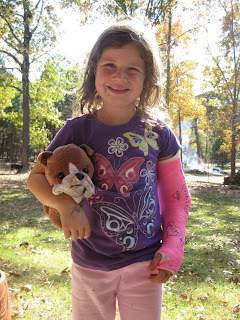 Bridget had a white soft cast, with instructions to come back in a week for her permanent cast. The boys were so glad to have their sister home! Henry and Jonah took such good care of Bridget, listened to all of her stories (I'm sure they wished they could have been at the hospital with us), helped her get things done and read stories to her. Nothing slows this girl down! Bridget had to miss her last soccer game of the season, but she cheerfully sat on the bench and encouraged her friends. She even helped Jonah build a nest in the pine straw during Henry's game! And ballet? 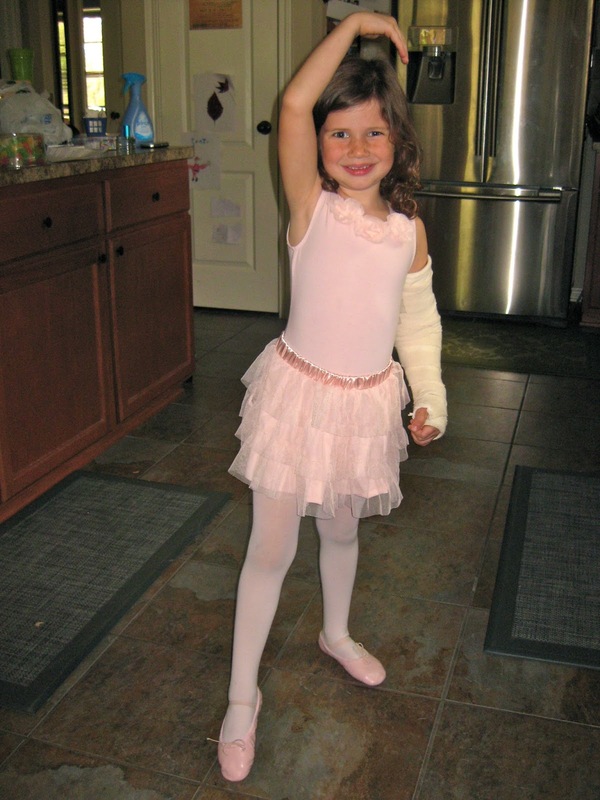 Of course a little broken arm wouldn't get in the way. A week later we were back at children's hospital to get the permanent cast put on. Bridget was very nervous, but it was painless and didn't take long at all. She chose bright pink, and let Jonah sign it first. Another week after that, we all ran in the Turkey Trot on Thanksgiving morning. 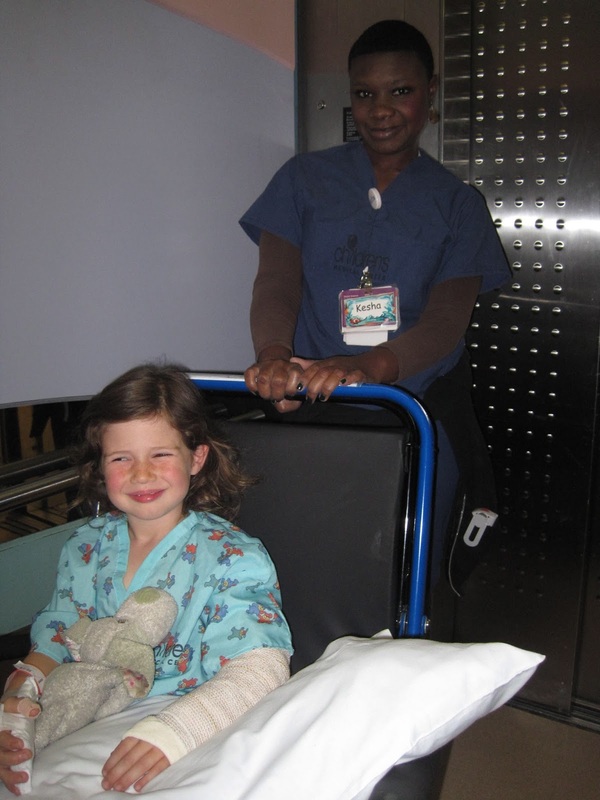 Bridget was a trooper and walked the entire way, lugging the extra weight of her cast along with her. Grammy was sweet enough to walk the whole way with her. The time with the cast passed pretty quickly. We got used to which clothes Bridget could get on and off over the cast. We found her a pair of leggings that she could use to cover up her other arm when it was cold and she had to wear short sleeved shirts. Finally we were able to head back to Dallas to have the cast removed and decide if the pins could come out. Bridget tried very hard to be brave, but it was pretty scary! They cut the cast off and tried to cover up the pins before Bridget could see them, but she saw them anyway. It isn't pleasant to see big metal pins sticking out of your elbow! Then they had to determine if they would be able to remove them or if she would need to be re-casted for another couple of weeks. The waiting was pure torture! They finally let us know they would pull the pins...they just pull them right out, and that part was a little painful. The whole thing didn't take very long, and the hospital staff was really good about trying to explain ahead of time everything they were going to do. They even had videos on an ipad that they had her watch to prepare for the noises and all that she would be experiencing. After they were finished with the pins and everything, the surgeon came in to say goodbye. He enjoyed visiting with Bridget. Then the nurse came in and told Bridget that because she had been very brave, she would be able to pick a very fun prize. She asked Bridget if she was most interested in dolls, barbies, puzzles, or what she liked best? Bridget answered her, "Well, if you could just bring everything out so I could see it, that would make it easiest!" 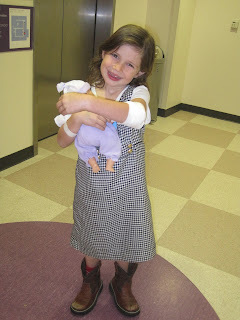 We decided that she would like a doll best, so the nurse went to get one for her. What a fun treat! On our way out of the hospital, we noticed a party of sorts in one of the lobbies. We went to see what it was all about and found that it was just a party for the kids who were currently admitted to the hospital. 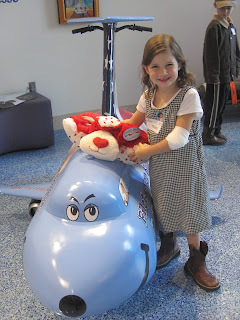 They asked why we were there, and they determined that even though Bridget wasn't a patient at the hospital, they could still give her a pillow pet. She was pretty thrilled to leave the hospital for the last time with that...and no more cast!